San Ildefonso Pueblo was home to Maria Martinez, probably the most famous of all Pueblo potters. 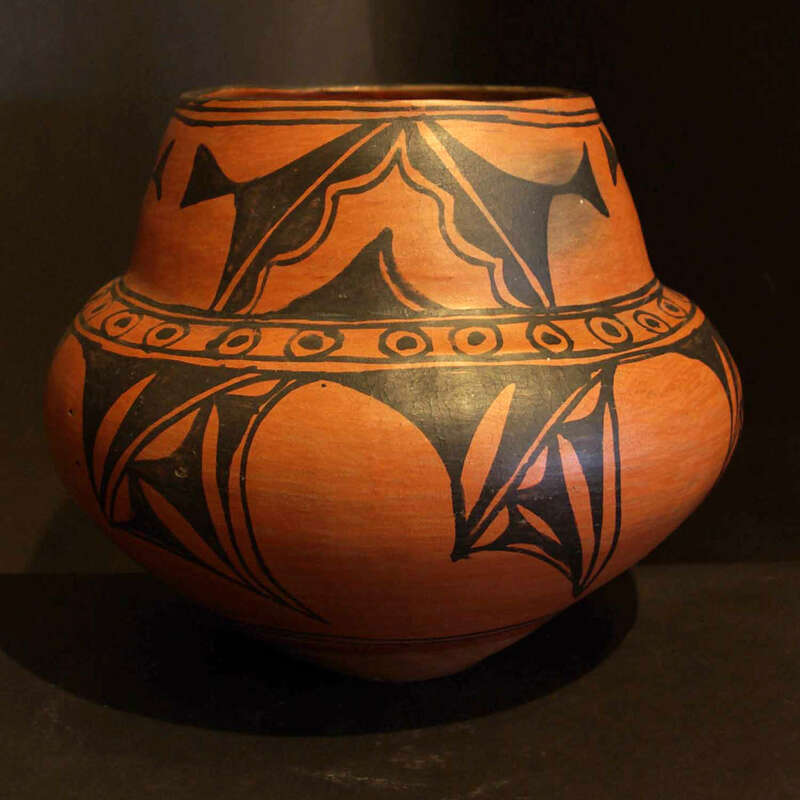 And Maria turned the Pueblo pottery world upside down beginning in 1922 when she first added her signature to a pot she'd made. In 1926 she turned it again when she had her husband Julian's signature added to the pieces he painted for her. About 25 miles north of Santa Fe, San Ildefonso Pueblo has been occupied since about 1300. The people trace their origins back to an area north of Mesa Verde and the migration to today's pueblo site included time spent on the Pajarito Plateau in villages like Otowi, Tsankawi, Navawi and Tynonyi. A Spanish report in 1591 counted about 2,000 people living in the village. Don Juan de Onate is reported to have visited in 1598 and the first pueblo mission church was completed in 1617. 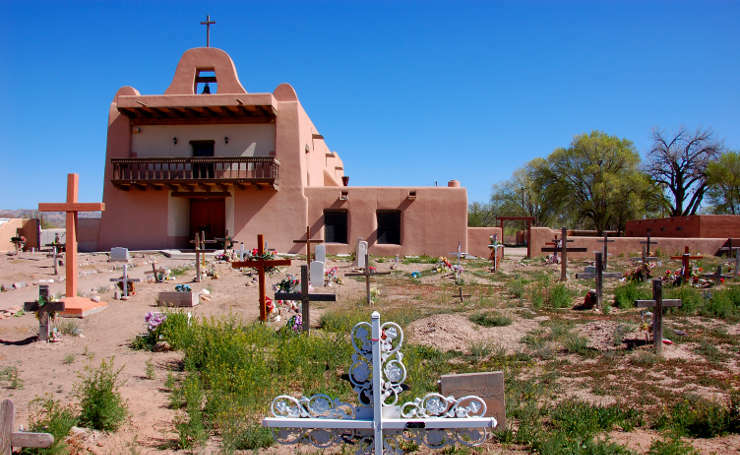 However, the people of San Ildefonso were in the forefront of the Pueblo Revolt of 1680 and that mission church was one of the first destroyed. 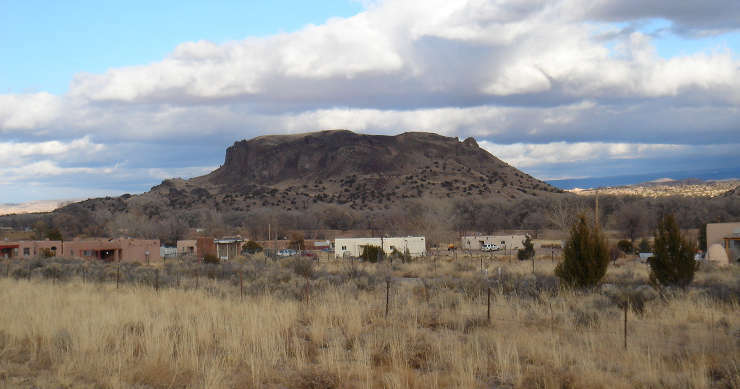 When the Spanish returned to the area in 1692, they found the people of the pueblo hiding on top of Black Mesa with the people of Santa Clara. The two peoples were able to successfully hold off the Spanish for a couple years but eventually had to come to terms with them. Most villagers returned to the pueblo area in 1694. The last San Ildefonso uprising occurred in 1696 when the tribe killed two priests and destroyed the newly rebuilt church again. It was 1717 before the pueblo had another church built. The present mission church was built between 1957 and 1969. The population of San Ildefonso after the Pueblo Revolt is estimated at 800. A series of smallpox epidemics between 1780 and 1793 reduced the population by more than half. The global Spanish flu pandemic in 1918 left only 88 members of the pueblo alive. That forced the pueblo to shift the main economic focus from agriculture to arts and crafts... and that's where Maria Martinez and her family stepped in. The potters of San Ildefonso had been making traditional polychrome pottery for hundreds of years but their market began to take off with the advent of the railroads in the 1880's. By 1908, Maria Martinez and her husband, Julian, were building a reputation for the quality of their Tunyo Polychrome pottery: Maria made the pots and Julian painted them. About 1919, Julian perfected a technique for creating a matte black paint on a polished black surface and the trademark San Ildefonso black-on-black style was born. Black-on-black went over so well with the tourists and collectors that it sparked a renaissance among pottery makers in other pueblos. Today, pottery making is a mainstay of the San Ildefonso economy.